Previously, we discussed the implications of intra-channel consistency for researchers. This post considers two types of variation in the customer experience: common and special cause variation, and their implications for customer researchers. The concepts of common and special cause variation are derived from the process management discipline Six Sigma. What are the implications of common and special cause variation for customer experience researchers? Given the differences between common cause and special cause variation, researchers need a tool to help them distinguish between the two. Researchers need a means of determining if any observed variation in the customer experience is statistical noise or a signal within the system. 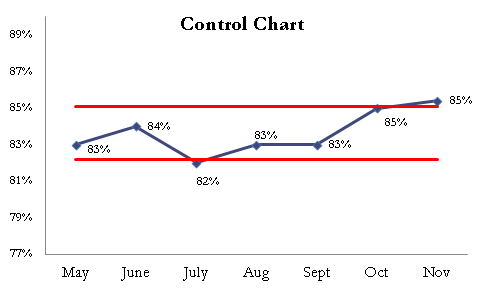 Control charts are a statistical tool to make a determination if variation is noise or a signal. Control charts track measurements within upper and lower quality control limits. These quality control limits define statistically significant variation overtime (typically at a 95% confidence), which means there is a 95% probability that the variation is the result of an actual change in the customer experience (special cause variation) not just normal common cause variation. Observed variation within these quality control limits are common cause variation. Variation which migrates outside these quality control limits is special cause variation. 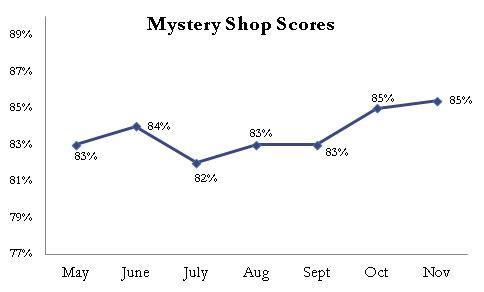 This chart depicts a set of mystery shop scores which both vary from month to month and generally appear to trend upward. Customer experience researchers need to provide managers a means of determining if the month to month variation is statistical noise or some meaningful signal within the system. Turning this chart into a control chart by adding statistically defined upper and lower quality control limits will determine if the monthly variation is common or special cause. To define quality control limits, the customer experience researcher needs to determine the count of observations for each month, the monthly standard deviation, and the average count of shops across all months. This control chart now answers the question, what variation is common cause and what variation is special cause. The general trend upward appears to be statistically significant with the most recent month above the upper quality control limit. Additionally, this control chart identifies a period of special cause variation in July. With 95% confidence we know some special cause drove the scores below the lower control limit. Perhaps this special cause was employee turnover, perhaps a new system rollout, or perhaps a weather event that impacted the customer experience. Previously, we discussed the implications of inter-channel consistency for researchers, and introduced a process for management to define a set of employee behaviors which will support the organization’s customer experience goals across multiple channels. This post considers the implications of intra-channel consistency for customer experience researchers. As with cross-channel consistency, intra-channel consistency, or consistency within individual channels requires the researcher to identify the causes of variation in the customer experience. The causes of intra-channel variation, is more often than not at the local level – the individual stores, branches, employees, etc. For example, a bank branch with large variation in customer traffic is more likely to experience variation in the customer experience. Regardless of the source, consistency equals quality. In our own research, Kinēsis conducted a mystery shop study of six national institutions to evaluate the customer experience at the branch level. In this research, we observed a similar relationship between consistency and quality. The branches in the top quartile in terms of consistency delivered customer satisfaction scores 15% higher than branches in the bottom quartile. But customer satisfaction is a means to an end, not an end goal in and of itself. In terms of an end business objective, such as loyalty or purchase intent, branches in the top quartile of consistency delivered purchase intent ratings 20% higher than branches in the bottom quartile. Purchase intent and satisfaction with the experience were both measured on a 5-point scale. Again, it is incumbent on customer experience researchers to identify the causes of inconsistency. A search for the root cause of variation in customer journeys must consider processes cause variation. One tool to measure process cause variation is a Voice of the Customer (VOC) Table. VOC Tables have a two-fold purpose: First, to identify specific business processes which can cause customer experience variations, and second, to identify which business processes will yield the largest ROI in terms of improving the customer experience. VOC Tables provide a clear road map to identify action steps using a vertical and horizontal grid. On the vertical axis, each customer experience attribute within a given channel is listed. For each of these attributes a judgment is made about the relative importance of each attribute. This importance is expressed as a numeric value. On the horizontal axis is a exhaustive list of business processes the customer is likely to encounter, both directly and indirectly, in the customer journey. This grid design matches each business process on the horizontal axis to each service attribute on the vertical axis. Each cell created in this grid contains a value which represents the strength of the influence of each business process listed on the horizontal axis to each customer experience attribute. Finally, a value is calculated at the bottom of each column which sums the values of the strength of influence multiplied by the importance of each customer experience attribute. This yields a value of the cumulative strength of influence of each business process on the customer experience weighted by its relative importance. Consider the following example in a retail mortgage lending environment. In this example, the relative importance of each customer experience attributes was determined by correlating these attributes to a “would recommend” question, which served as a loyalty proxy. This yields an estimate of importance based on the attribute’s strength of relationship to customer loyalty, and populates the far left column. 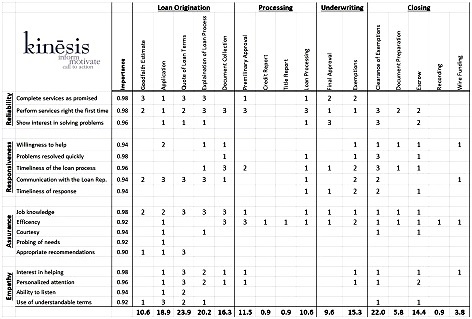 Specific business processes for the mortgage process are listed across the top of this table. Within each cell, an informed judgment has been made regarding the relative strength of the business process’s influence on the customer experience attribute. This strength of influence has been assigned a value of 1 – 3. It is multiplied by the importance measure of each customer experience attribute and summed into a weighted strength of influence – weighted by importance, for each business process. In this example, the business processes which will yield the highest ROI in terms of driving the customer experience are quote of loan terms (weighted strength of influence 23.9), clearance of exemptions (22.0), explanation of loan terms (20.2), loan application (18.9) and document collection (16.3). Next, we will look into the concepts of common and special cause variation, and another research methodology designed to identify areas for attention. Control charts as just such a tool. Previously, we discussed the business case and implications for customer experience mangers for inter-channel consistency. This post considers the implications of cross-channel consistency for customer experience researchers. The first research implication of inter-channel consistency is to understand that researchers must investigate service delivery consistency at its cause. The range of choices available to customers here in the 21-st century is incredible. Gone are the Henry Ford days when you, as he put it, “could have any color you want as long as it’s black.” Modern customers have an array of choices available to them not only in the brands but in delivery channels. Modern brands must serve channels in the channel of the customer’s choice, be it on-line, mobile, contact center, or in-person. As customer choice expands cross-channel consistency has become more and more important. The problem for customer experience researchers is that this channel expansion requires a broad tool box of research techniques, as different channels require unique systems and processes appropriate to the channel. Systems and processes for on-line channels are different than those for in-person channels. These different systems and processes often lead to the siloing of channels, which may help make individual channels more efficient, but run the risk in inconsistencies in the customer experience from one channel to the other. Customers, however, don’t look at a brand as a collection of siloed channels. Customers do not care about organizational charts. They expect a consistent customer experience regardless of channels. Customers expect cross-channel consistency. If senior management has defined the customer experience organization-wide, the researcher’s role in coordinating research tools is much easier. If management has not defined the customer experience organization-wide, the researcher’s role is nearly impossible. The first step in defining the customer experience organization-wide is writing a clear customer experience mission statement which clearly communicates how customers should experience the brand, and how management wants customers to feel as a result of the experience. Next, the customer experience should be defined in terms of broad dimensions and specific attributes which constitute the desired customer experience and emotional reaction to the brand. Once each of the above dimensions has been defined in terms of specific attributes, the next step in translating the customer experience definition to action is to define a set of empirical behaviors which support each attribute. For example, establishing trust is an attribute of relationship building. Repeating this process of mapping behaviors to each of the attributes will produce a complete list of employee behaviors appropriate to each channel in support of management’s broader customer experience objectives. Customer experience researchers are constantly looking for ways to make their observations relevant, to turn observations into insight. Observing a behavior or service attribute is one thing, linking observations to insight that will maximize return on customer experience investments is another. One way to link customer experience observations to insights that will drive ROI is to explore the influence of customer experience attributes to key business outcomes such as loyalty and wallet share. The first step is to gather impressions of a broad array of customer experience attributes, such as: accuracy, cycle time, willingness to help, etc. Make this list as long as you reasonably can without making the survey instrument too long. The next step is to explore the relationship of these service attributes to loyalty and share of wallet. In our experience, two questions: a “would recommend” and primary provider question, yield valuable insight into the relative importance of specific service attributes. Together, these two questions form the foundation of a two-dimensional analytical framework to determine the relative importance of specific service attributes in driving loyalty and wallet share. Research has determined the business attribute with the highest correlation to profitability is customer loyalty. Customer loyalty lowers sales and acquisition costs per customer by amortizing these costs across a longer lifetime – leading to some extraordinary financial results. Measuring customer loyalty in the context of a survey is difficult. Surveys best measure attitudes and perceptions. Loyalty is a behavior not an attitude. 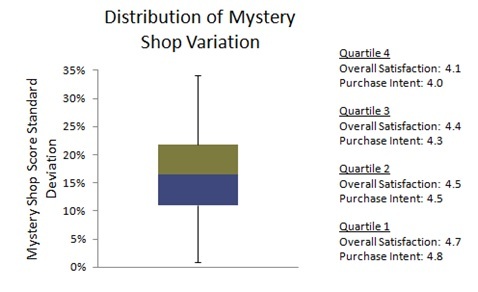 Survey researchers therefore need to find a proxy measurement to determine customer loyalty. A researcher might measure customer tenure under the assumption that length of relationship predicts loyalty. However, customer tenure is a poor proxy. A customer with a long tenure may leave, or a new customer may be very satisfied and highly loyal. Likelihood of referral captures a measurement of the customer’s likelihood to refer a brand to a friend, relative or colleague. It stands to reason, if one is going to refer others to a brand, they will remain loyal as well, because customers who are promoters of a brand are putting their reputational risk on the line. This willingness to put their reputational risk on the line is founded on a feeling of loyalty and trust. In our experience asking the “yes/no” question: “Would you refer us to a friend, relative or colleague?” produces starker differences in this two-dimensional analysis making it easier to identify which service attributes have a stronger relationship to both loyalty and engagement. Similar to loyalty, customer engagement or wallet share can lead to some extraordinary financial results. Wallet share is the percentage of what a customer spends with a given brand over a specific period of time. Also similar to loyalty, measuring engagement or wallet share in a survey is difficult. There are several ways to measure engagement: one methodology is to use some formula such as the Wallet Allocation Rule which uses customer responses to rank brands in the same product category and employs this rank to estimate wallet share, or to use a simple yes/no primary provider question. Using these loyalty and engagement measures together, we can now cross tabulate the array of service attribute ratings by these two measures. This cross tabulation groups the responses into four segments: 1) Engaged & Loyal, 2) Disengaged yet Loyal, 3) Engaged yet Disloyal, 4) Disengaged & Disloyal. We can now make comparisons of the responses by these four segments to gain insight into how each of these four segments experience their relationship with the brand. 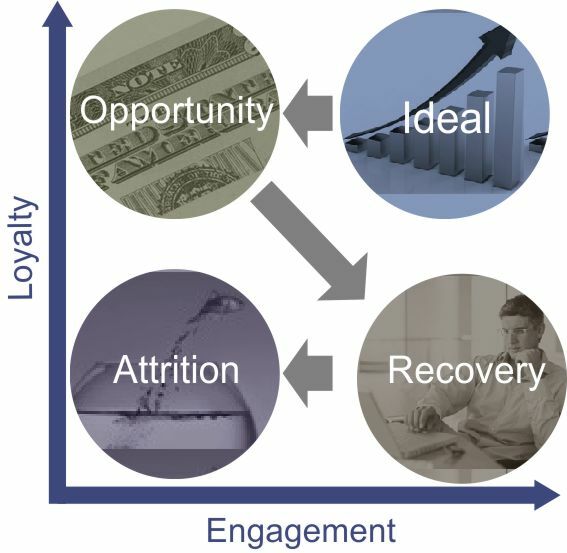 These four segments represent: the ideal, opportunity, recovery and attrition. Ideal – Engaged Promoters: This is the ideal customer segment. These customers rely on the brand for the majority of their in category purchases and represent lower attrition risk. In short, they are perfectly positioned to provide the financial benefits of customer loyalty. Comparing attribute ratings for customers in this segment to the others will identify both areas of strength, but at the same time, identify attributes which are less important in terms of driving this ideal state, informing future decisions on investment in these attributes. Opportunity – Disengaged Promoter: This customer segment represents an opportunity. These customers like the brand and are willing to put their reputation at risk for it. However, there is an opportunity for cross-sell to improve share of wallet. Comparing attribute ratings of the opportunity segment to the ideal will identify service attributes with the highest potential for ROI in terms of driving wallet share. Recovery – Engaged Detractor: This segment represents significant risk. The combination of above average share of wallet, and low commitment to put their reputational risk on the line is flat out dangerous as it puts profitable share of wallet at risk. Comparing attribute ratings of customers in the recovery segment to both the ideal and the opportunity segments will identify the service attributes with the highest potential for ROI in terms of improving loyalty. Attrition – Disengaged Detractor: This segment represents the greatest risk of attrition. With no willingness to put reputational risk on the line, and little commitment to placing share of wallet with the brand, retention strategies may be too late for them. Additionally, they most likely are unprofitable. Comparing the service attributes of customers in this segment to the others will identify elements of the customer experience which drive attrition and may warrant increased investment, as well as, elements that do not appear to matter very much in terms driving runoff, and may not warrant investment. By making comparisons across each of these segments, researchers give managers a basis to make informed decisions about which service attributes have the strongest relationship to loyalty and engagement. Thus identifying which behaviors have the highest potential for ROI in terms of driving customer loyalty and engagement. This two-dimensional analysis is one way to turn customer experience observations into insight. Previously we discussed ways researchers can increase the likelihood of respondents opening an email survey invitation. Additionally, in a subsequent post we discussed how to get respondents to actually click on the survey link and participate in the survey. This post is a discussion of ways to keep respondents motivated to complete the entire survey once they have entered it. At its core, the key to completion rates is an easy to complete and credible survey that delivers on all promises offered in the invitation email. From time to time various service providers of mine send me a survey invite, and I’m often surprised how many of them impose upon me, their customer, to complete a 30 or 40 minute survey. First of all, they never disclose the survey length in advance, which communicates a complete lack of respect for my time. In addition to just plain being an imposition, it is also a bad research practice. Ten minutes into the survey I’m either pressed for time, frustrated, or just plain bored, and either exit the survey or frivolously complete the remaining questions without any real consideration of my opinions on the questions they are asking – completely undermining the reliability of my responses. This is just simply a bad research practice, in addition to being inconsiderate of the end customer’s time. We recommend keeping survey length short, no more than 10 to 12 minutes – in some cases such as a post-transaction survey – 5 minutes. If research objectives require a long survey, rather than impose a ridiculously long survey on your customers producing frivolous results, break a 30 – 40 minute survey into two, or better yet, three parts fielding each part to a portion of your targeted sample frame. Additionally, skip logic should be employed to avoid asking questions that are not applicable to a given respondent, thus decreasing the volume of questions you present to the end customer. Finally, include a progress bar to keep respondents informed of how far along they are on the survey. The last thing you want respondents feeling when they complete your survey is frustration. First of all, if the sample frame is made up of your customers, the primary thing you are accomplishing is upsetting your customers and damaging your brand. And also, creating bad research results because frustrated respondents are not in the proper mindset to give you well considered answers. Frustration can come from awkward design, question wording, poor programming, and insufficient response choices. Survey wording and vocabulary should be simple and jargon free, response choices should be comprehensive, and of course the survey programming should be thoroughly proofed and pretested. Pretesting is a process where the survey is prefielded to a portion of the sample frame to test how they respond to the survey, significant portions of the questionnaire unanswered or a high volume of “other” or “none of the above” responses could signal trouble with survey design. Survey completion should be easy. Survey entry should work across a variety platforms, browsers and devices. Additionally, respondents should be allowed to take the survey on their own time, even leaving the survey while saving their answers to date and allowing reentry when it is more convenient for them. It is incumbent on researchers fielding self-administered surveys to maximize response rates. This reduces the potential for response bias, where the survey results may not accurately reflect the opinions of the entire population of targeted respondents. Previously we discussed ways researchers can increase the likelihood of respondents opening an email survey invitation. This post addresses how to get respondents to actually click on the survey link and participate in the survey. Don’t bury the lead. The opening sentence must capture the respondent’s attention and make the investment in effort to read the invitation. Keep in mind most people skim emails. Keep text of the invitation short, paying close attention to paragraph length. The email should be easy to skim. Offering respondents a reward for participation is an excellent way to motivate participation. Tangible incentives like a drawing, coupon, or gift card, if appropriate and within the budget, are excellent tools to maximize response rates. However, rewards do not necessarily need to be tangible. Intangible rewards can also prove to be excellent motivators. People, particularly customers who they have a relationship with the brand, want to be helpful. Expressing the importance of their option, and communicating how the brand will use the survey to improve its offering to customers like the respondent is an excellent avenue to leverage intangible rewards to motivate participation. Intangible rewards are often sufficient if the respondent’s cost to participate in the survey is minimal. Perhaps the largest cost to a potential respondent is the time required to complete the survey. Give them an accurate estimate of the time it takes to complete the survey – and keep it short. We recommend no more than 10 minutes, more preferably five to six. If the research objectives require a longer survey instrument, break the survey into two or three shorter surveys and deliver them separately to different targeted respondents. Do not field excessively long surveys or mis-quote the estimated time to complete the survey – it is rude to impose on your respondents not to mention disastrous to your participation rates – and it’s unethical to mis-quote the survey length. As with getting the participants to open the email – creditability plays a critical role in getting them to click on the survey. One of the best ways to garner credibility with the survey invite is to assure the participant confidentiality. This is particularly important for customer surveys, where the customers interact commonly with employees. For example, a community bank where customers may interact with bank employees not only in the context of banking but broadly in the community, must ensure customers that their survey response will be kept strictly confidential. Personalizing the survey with appropriate merge fields is also an excellent way to garner credibility. Make it as easy as possible for the participant to enter the survey. Program a link to the survey, and make sure it is both visible and presented early in the survey. Again, most people skim the contents of emails, so place the link in the top 1/3 of the email and make it clear that it is a link to enter the survey. In designing survey invitations, remember to write short, concise, easy to read emails that both leverage respondent’s reward centers (tangible or intangible), and credibly estimate the short time required to complete the survey. This approach will help maximize response rates and avoid some of the pitfalls of response bias. Click here for the next post in this series in prompting respondents to complete the survey. In fielding surveys researchers must be aware of the concepts of error and bias and how they can creep into a survey, potentially making the survey unreliable in ways that cannot be predicted. For example, one source of error is statistical error, where not enough respondents are surveyed to make the results statistically reliable. Another source of error, or bias, is response bias caused by not having a random sample of the targeted population. A key concept of survey research is randomness of sample selection, in essence to give each member of the targeted survey population an equal chance of being surveyed. Response rates are important in self administered surveys (such as an email surveys), because it is possible non-responders (people who for some reason choose not to complete the survey) have different opinions than those who choose to participate in the survey. As a result, the survey is not purely random. If non-responders are somehow different than responders, the survey results will reflect that difference – thus biasing the research. It is therefore incumbent on researchers to maximize the survey response rate. Say for example, a bank wants to survey customers after they have completed an online transaction. If customers who love the bank’s online capabilities are more likely to participate in the survey than those who do not like the bank’s online capabilities, the survey results will be biased in favor of a positive view of the bank’s online offering because it is not a representative sample – it is skewed toward customers with the positive view. It is, again, incumbent on researchers to maximize the response rate as much as possible in self-administered email surveys. Letter on company letterhead, signed by a high profile senior executive. Each of these three are excellent ways to introduce the survey to respondents and maximize response rates. The next steps in maximizing response rates in email surveys is passing SPAM filter tests, and prompting the recipient to open the email. The core concept here is credibility – to make the email appear as credible as possible. Both the FROM and SUBJECT lines are critical in getting the respondent to open the email. The FROM line has be as credible and recognizable as possible, avoiding vague or generic terms like “feedback”. For surveys of customers, the company name or the name of a recognizable representative of the company should be used. The SUBJECT line must communicate the subject of the email in a credible way that will make the respondent want to open the email. Keep it brief (50 characters or less), clear, concise and credible. Not only is the content of the email important, but the timing of delivery plays a role in response rates. In our experience sending the survey invitation in the middle of the week (Tuesday – Thursday) during daytime hours increases the likelihood that the email will be noticed by the respondent. After an appropriate amount of time (typically for our clients 5 days), reminder emails should be sent, politely reminding the respondent of the previous invitation, and highlighting the importance of their opinion. One, perhaps two, reminder emails are appropriate, but do not send more than two. To maximize the probability that respondents will receive and open the email focus on sending a credible email mid-week, one which will pass SPAM filter tests, contain accurate credible and compelling SUBJECT and FROM lines, and send polite reminder emails to non-responders. But opening the email is just the first step. The actual objective is to get the respondents to open and complete the survey. Click here for the next post in this series in prompting respondents to participate in the survey.